A very welcome return of Scottish pop favorites The Hermit Crabs! The first release since the celebrated ‘Correspondence Course’ EP in 2009, the new ‘Time Relentless’ EP shows the band in remarkably fine form across four new songs mixing acoustic and electric guitars with nice bursts of percussion and keyboards. Lead track ‘On The Spectrum’ is the comparison of two relationships set to jangling guitars, with an ace chorus about taking photographs, kissing in the rain, and talking about the blues. ‘Time Relentless’ combines classic Hermit Crabs orchestration with lyrics taken from a poem by Scottish cyclist Graeme Obree from his autobiography ‘The Flying Scotsman’. Keyboards and chiming guitars set the perfect tone for the stunning imagery of the poem. ‘Stop This Now’ is an upbeat two-minute pop hit about another relationship, showcasing twinkling guitars and exquisite harmonies, while final track ‘So Blue’ is an autumnal, mid-tempo tale about supporting a friend through a somber time, with layered instrumentation that builds to an especially melodic conclusion. 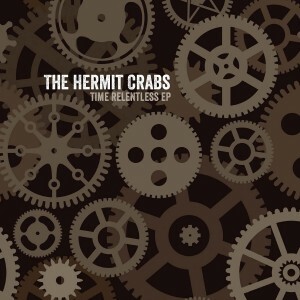 Limited to 1000 copies in custom minijacket sleeve, ‘Time Relentless’ is another Scottish pop triumph for the Hermit Crabs!